BikeSD is the first and only Advocate Dealer for Dero bike racks in the San Diego region, meaning a portion of your purchase goes towards supporting our work and creating safer streets for biking and walking in San Diego’s urban core. There’s good bike parking and there’s bad bike parking. And not all bike parking is created equal. BikeSD can help you find the right solution to meet your needs for bike parking on private property or residential addresses. To request bike rack installation in the city’s public right-of-way, you can make a request with the city. We are more than “avid” cyclists at BikeSD, our mission is to establish San Diego as a world-class bicycling city by promoting everyday riding. We do this by advocating for and promoting world-class bicycling infrastructure that contributes toward an aesthetic, livable urban environment. We know the challenges and frustrations people face when trying to find secure bike parking because we hear about it all of the time. We make recommendations that bicycle riders appreciate. Space limitations, user demands, surface types, security needs, concerns about appearance, and budgets all play a factor in selecting the right bike parking. BikeSD has over three years of experience advocating for better bicycling in San Diego, and our advocacy has resulted in real change on our city streets. 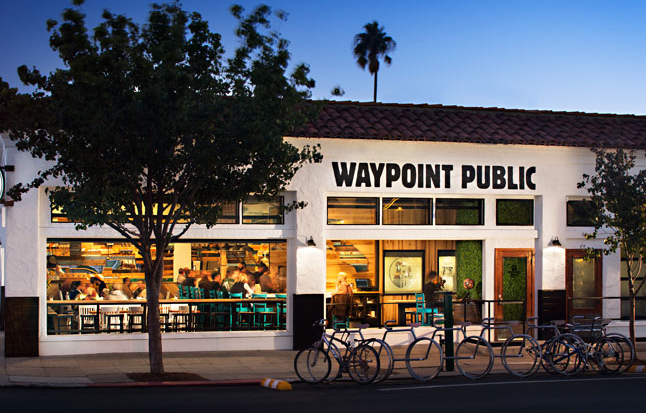 BikeSD will help you navigate San Diego’s bike parking standards and permits, recommends quality bike racks to best meet your needs, and we also offer free site-visits to make sure it’s done right. BikeSD has teamed up with Dero Bike Racks in this effort. Dero has been supplying innovative, high quality, thoughtfully designed bike parking and bicycle transit solutions to architects, contractors, municipalities, higher education, and parks and rec since 1995. Together we offer exceptional customer service, quick turn-around for quotes and invoices, and free CAD layouts. All bike parking sales benefit BikeSD’s bike advocacy efforts. Check out the video below for why good bike parking is important. Below are some popular choices to help get you started. Dero offers a wide range of styles and finishes, including custom racks to meet your budget and taste. If you need more information or are ready to place an order let us know. The Bike Bike Rack is an eye-catching, functional piece of street art. It welcomes people on bikes and provides them a secure, convenient place to park. Parks two to four bikes. The Hoop Rack is a proven design that provides high security and easy bike parking. The Hoop Rack uses thick pipe construction and the full radius of the bend makes the Hoop an attractive and functional bike rack. There’s a Heavy Duty version too for added security. The Hoop Rack supports the bicycle at two points and allows for the wheel and frame to be secured using a u-style bike lock. Each Hoop Rack parks two bikes. 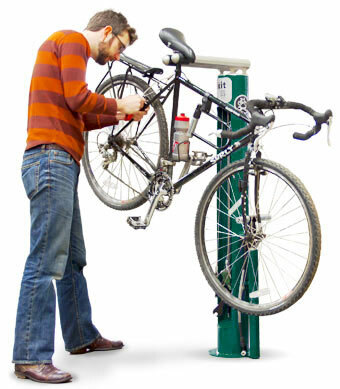 The Swerve Rack is a proven design that provides high security and easy bike parking. The Swerve Rack uses thick pipe construction and the full radius of the bend makes the Swerve an attractive and functional bike rack. The Swerve Rack supports the bicycle at two points and allows for the wheel and frame to be secured using a u-style bike lock. Each Swerve Rack parks two bikes. The Bike Hitch is an attractive and space efficient bike rack. The Bike Hitch was specifically designed for sidewalks and other narrow space applications. The design of this bicycle rack restricts bikes to parking parallel with the rack, so bikes won’t intrude into the sidewalk or street. The Bike Hitch uses thick tube construction and the full radius bend of the ring makes it almost impossible to cut with a pipe cutter. It allows for the wheels and the frame to be secured using a u-style bike lock. The Downtown Rack uses thick, square-tube construction that can’t be cut with a pipe cutter. The extended width of the Downtown Rack makes for easy bike parking by giving the bike full support and multiple locking points for a u-style bike lock. The elegant yet simple style lends itself to notable properties. Break-a-way nuts or concrete spike anti-theft hardware options are included with the Downtown Rack. The Campus Rack provide you with superior bike support, orderly bicycle parking and high security. The design of this bike rack supports the frame of the bike while keeping the fork from twisting. The result is convenient, orderly bike parking. The Campus Rack is available in single or double sided models in various lengths. The single sided model is ideal for sidewalk placement, while the double sided model staggers bikes opposite from each other for greater space efficiency. The Campus Rack will also accommodate scooters. The Ultra Space Saver provides easy and ample space for u-lock security on nearly any bike, including bikes with fenders. Thanks to design enhancements, the double-sided Ultra Space Saver parks more than double the capacity of a standard bike rack. The Ultra Space Saver is an easy to install, modular system. It can be made to fit in nearly any space. Options include: wall-mount, floor-mount, and double-sided. It’s the perfect solution for a new bike room. You are riding home from work when you notice your bike needs some adjusting. The bike shop is closed and out of your way, so now what? Fixit to the rescue! The Fixit includes all the tools necessary to perform basic repairs and maintenance, from changing a flat to adjusting brakes and derailleurs. The tools and air pump are securely attached to the stand with stainless steel cables and tamper-proof fasteners. Hanging the bike from the hanger arms allows the pedals and wheels to spin freely while making adjustments. Few things say, “we love bikes” more than a Fixit. Got an idea for a great bike rack? Send us a rough sketch on a napkin, a logo, or just an idea – and we will work with you to turn your concept into a fully functional piece of street art. Dero Zap is an automated commuter tracking system that assists governments, companies, and non-profits to implement bike commuter programs with benefits, like reduced health care cost and discounts at grocery stores. 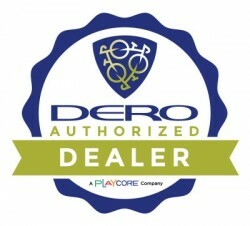 If you want to see more options check out the Dero site.